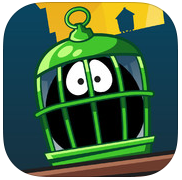 Get ready for some adrenaline-pumping fun in City Birds! When goofy multi-colored birds run amok, you’ll need to trap them in cages and return them to the wildlife preserve to save the city from being overrun by the feathered flock. Interestingly, the idea behind City Birds was inspired by the story of Captain Sully who landed an airplane on the Hudson River in New York after it was hit by a flock of birds. The game starts with an easy-to-follow tutorial that introduces you to the gameplay. After learning the basics, I was hooked by the chaos and speed of the game. Among other challenges, you’ll need to save dive-bombing eggs, drag birds to their cages as they fly across the screen, and stop deadly dynamite from exploding. 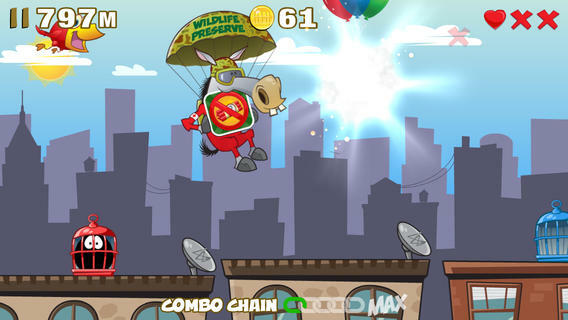 The rapid and addicting gameplay is paired with incredible graphics created by cartoonist and web designer Noah Malewicz. To learn Corona SDK, Noah relied on Dr. Brian Burton’s development book and, in six short months, published City Birds to the App Store. Thanks to his background in PHP and ActionScript, Noah had no trouble learning Lua. Some Corona features that Noah relied upon were Storyboard, widgets, the built-in JSON library, in-app purchases, and Game Center networking. Download City Birds for $0.99 from the App Store and see how many birds you can capture in a matter of minutes. With sharp hand-eye coordination and a keen sense of focus, you can excel at the game and earn coins to unlock quirky new birds. Thanks Daniel… I can’t tell you how many tries it took to finally get the birds I was happy with. Very excited to be chosen as App of the Week! Hey Noah, great show today. Thank you answering all the questions I had! For you and people who have problem with the review button in your app, Scott Aldeman provided me this link (Thanks Scott!) where you can generate a direct link to your app in the appstore (IOS) Make sure to select apps in the menu. I am going to update my app that way and see. Right now, it seems that people who try to review my app cannot because the link has changed. Hey Mo, I just saw this comment. It was great to talk to you on the show. Is there a link that will connect directly to the REVIEW section of the App Store like it did before?